No matter where you are from; if you are arrested in Anaheim you will need a local bail bondsman in the Anaheim area. Our agents are ready to get you and yours out immediately. To locate your loved one or to find out what crimes they have been charged with, please call us at 714-772-2045 or fill out the “Find an Inmate” form to locate an inmate in any Orange County Jail below. When you call us you will speak directly with the one of our family members who will answer all of your questions in a professional and personable manner. We will take the time to understand your needs and answer any questions before providing our professional recommendations at no cost for your situation. If then you decide that posting bail is the best for you, our bail bond agents will assist you with every detail related to getting and posting bail. 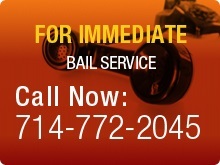 Please call us today toll-free for immediate bail bond service in Anaheim. We are looking forward to helping you. Please view the other pages in our website to give you a better understanding of our company and the bail bond process in Anaheim California. Call us for a free-consultation and find the difference in fast, discreet, professional bail bonds service. Use the "Find an Inmate" form below to submit a search request to locate an inmate in any Southern California, Anaheim Orange County jail.